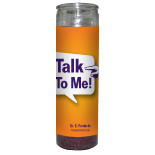 Ordered this candle at the suggestion of Mama Emduring our reading. Ordered Wednesday, my guy and I briefly spoke Thursday morning & made plans to meet up over the weekend. We spoke Sunday just like Mama E said we would. In all honesty it wasn't a conversation I wanted to have (didn't tell Mama E when she mentioned it), but we had it. Looking forward to reading the candle report. Date Added: 01/17/2017 by R. M.